This week I am going to present to you a curated list of some of my favorite cooking items and some items that earned a spot on my wishlist. There are some great items here that are all available on Amazon. I think most of my readers will agree that these are some great items to have if you are a home chef. These kitchen essentials might just make you the next top chef. Circulon Symmetry Chocolate Hard Anodized Non-Stick 11 Piece Cookware Set – I actually do own this exact set of cookware from Circulon. My husband did an awesome thing for me and got these as a gift for me. I am completely in love with this cookware set. It truly does have non-stick surfaces and nothing every sticks to these pots and pans. They are also dishwasher safe, which is a huge plus because I dread handwashing. These also have a nice heavy-duty feel to them. They do not have a cheap feeling at all and feel as though they will last me quite a long time. Love this set and I highly recommend it! Staub 5.5 Quart Round Cocotte, Graphite Grey – This is another piece of cooking equipment that I have the pleasure of owning and this piece here is my pride and joy in my collection of cooking items. Talk about heavy-duty… this piece is it! I use this dutch oven quite often in the kitchen and it is always a joy to use. It is the perfect size for whipping up dishes for my family of 3. It is oven safe to 500-degrees and another big bonus with this is that it is dishwasher safe. I enjoy using this for my pasta sauces that simmer on the stove for a couple hours. I use it for soups, and it is the most excellent pot for cooking a big batch of soup. I also use this for one pot meals. This Staub will last me a lifetime. Cuisinart 14 Cup Food Processor, Brushed Stainless Steel – I have this Cuisinart food processor on my wishlist currently. I own a Cuisinart food processor at the moment but since I am getting more serious about cooking I feel like this one would be a great upgrade. The 14-cup size of this is perfect for anything… that is huge for a food processor! This also includes shredding and slicing blades to make your cooking prep a breeze. I use my food processor for making nice-creams and for my paleo baking projects. KitchenAid Sprizalizer Plus Attachment With Peel, Core, and Slice – I am really excited about this item here. This is another item on my wishlist and I would love to have my KitchenAid stand mixer get married to this cooking device. If you are doing a low-carb diet then vegetable noodles are almost like a necessity in your eating regimen. Veggie noodles are an awesome alternative to traditional pasta and I feel as though they actually are much more flavorful. I love eating zoodles and this attachment for my mixer would make my prep so much easier. It comes with 3 spiraling blades and 3 different slicing blades. It also comes in handy for coring apples. Instant Pot Duo Plus 6 Quart 9-in-1 Programmable Pressure Cooker – Here is a cooking tool that I believe everyone would like to have… the infamous Instant Pot! This handy device does just about everything. This particular model is great for families that have 4-6 people. With just the push of a few buttons, you can have a quick meal ready to eat. This would be wonderful to have when you are short on time but still want to serve up a delicious meal. Hamilton Beach Slow Cooker 6 Quart Stainless Steel – I do own this slow-cooker and it sure comes in handy for my favorite fall and winter foods. I love cooking soups, stews, and roasts in my slow-cooker. This one I have had for a few years and it has never let me down. Bluetooth Meat Thermometer With 6 Probes And WiFi Remote – Now this is just neat! Technology sure has come a long way right? This meat thermometer actually has WiFi capabilities. You can monitor your cooking through the app. It also comes with six separate probes so you can monitor six different items and get a temperature reading on them. To me, this is just super cool. Want it! Anova Culinary Sous Vide Precision Cooker With WiFI And Bluetooth – Sous vide is something that I am totally intrigued by. My brother-in-law uses this method of cooking for meat. I have had the opportunity to sample some of the meals he created through this technique and he achieved marvelous results! This is a serious device for a serious home chef and I would love to have this in my kitchen for some next-level cooking. Breville Smart Oven Pro Convection Toaster Oven – Truth be told, I have never owned a toaster oven. I sure would love to park this on my countertop though. This would be excellent to have on my made-from-scratch pizza nights! It also has a 6 slice toaster capacity. The inside surfaces are non-stick and this product claims to be easy to clean up. What other kitchen essentials would you add to this must-have list? Leave me a comment and let me know. Love Amazon? Check out these sweet deals! Why not check out Amazon Fresh! Unlimited grocery delivery for $14.99 a month. Sign up HERE and start saving! Not a Prime member yet? Sign up for your 30-day free trial HERE. EBT cardholders qualify for Amazon Prime for only $5.99/month! Sign up HERE. Did you know that Kindle Unlimited has a large variety of cookbooks available to read? Sign up for your first month FREE right HERE and get reading and cooking! Hope you enjoyed this post and fall in love with something on this list! Thank you for reading and TGIF! Have a wonderful weekend everyone! DISCLAIMER:Â THIS POST CONTAINS AMAZON AFFILIATE LINKS. I DO RECEIVE A SMALL COMMISSION IF ITEMS ARE PURCHASED THROUGH THESE LINKS. ALL OPINIONS STATED HERE ARE MY OWN. 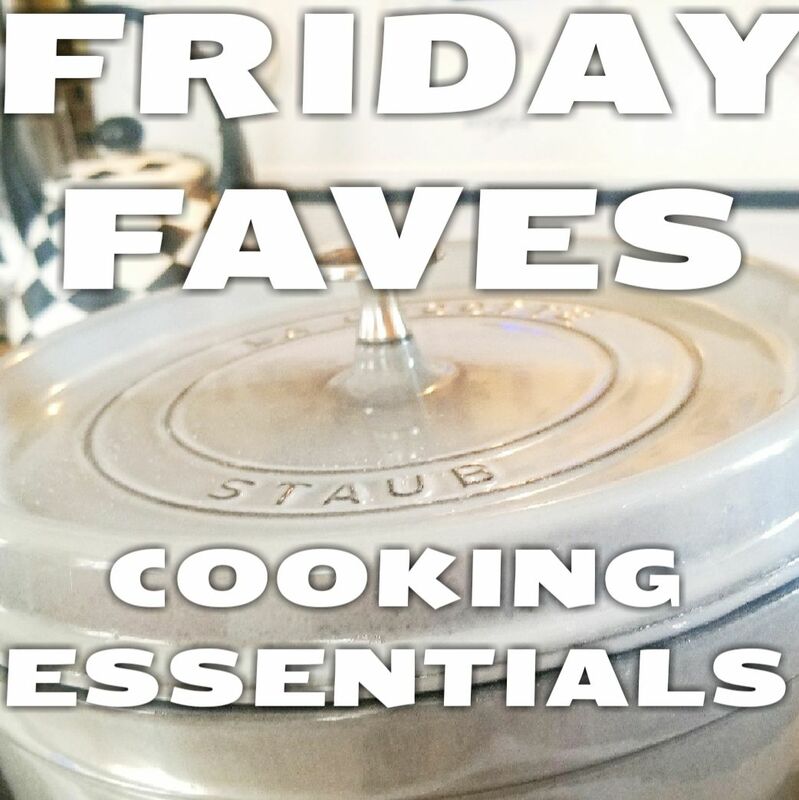 This entry was posted in Friday Faves, Shopping Guide and tagged amazon, circulon, cooking, cookware, Cuisinart, dutch oven, food processor, Friday Faves, kitchen, kitchen gadgets, kitchen tools, kitchenaid, kitchenaid mixer, shopping, spiralizer, Staub, veggie noodles, wishlist, zoodles. Bookmark the permalink. All of these items seem very useful, I will definetly havve to check them out.